I admit it. I almost missed my dear friend's birthday. We made last minute plans to go out with her and her husband the other night at 5:30, and at 5PM I got an email from her husband saying "hey, it's her birthday tomorrow!" Whoops! (I mean, I knew it was at the end of February, but how did we get to the end so fast??) Well, you know I had puh-lenty of cards laying around here (and fortunately even had one I knew she really liked already!) but I had to put together an impromptu gift, FAST, as we had to leave in 20 minutes to meet them! Luckily, with Arranged with Love, a bottle of wine, and some waterproof labels , putting together something pretty and appropriate was not a problem! Here it is, my own private happy birthday label! I stamped the frame onto the waterproof label in Memento Tuxedo Black, centering the little greeting card so as not to catch any of the borders on the sticker. After adding my greeting, I quickly colored it with Copics, sponged on a bit of Antique Linen Distressing ink and placed it over the existing wine label! Done in 15 minutes, (with time to spare to take photos for the blog heh heh), whew!! If you haven't used these labels before, you do not need to use special inks to stamp or color, kind of unbelievable I know, but true, your artwork is now waterproof! With all the sentiments included in the "Arranged with Love" set, a personalized wine label like this one makes the perfect quick gift for weddings and anniversaries as well, and one that the recipient is sure to remember. Who knows how many times this set will save my hide in the future LOL! (Don't worry I'm still getting her something else, just didn't want to show up empty handed! ;) Hope this project inspires you to give the waterproof labels a try if you have not yet discovered how terrific they are for gifting! Here is a Lovely Lavender card I made for our release party with Rupa's "O Baby!" set. The little rocking horse was just calling "rock me, Melanie!" So I made a tilt mechanism, and it is super simple to do. Color and cut out the rocking horse. I decided to use one of Nina's "Lovely Labels" as the base to frame it. You will need 2 pennies and two 1/4" pop dots, just as you do with a spinner card to create the tilting mechanism. Adhere a pop dot on the back of the horse in the center, then a penny. and a pen. Take a craft knife and cut a hole slightly taller and 1/8-1/4" wider than the pop dot in the the middle of the label. Put the second pop dot on the back of the penny, then put the pop dot through the hole and adhere the second penny to the back. Your horse is ready to rock! Pop the label up with more pop dots onto your card base ( more Lavender and Pure Luxury White, embossed with Swiss Dot to give the penny room to move back and forth behind the mat. That's it! There she goes!! I made mine dappled with Copics to match the cut polka dots in the label image. Enjoyed this tutorial? Please feel free to share it with others by linking it on your blog, I appreciate it! Thought I'd hop into the Tuesday Trigger this week (since everybody else was doin' it!) and I haven't had enough time to love on Theresa's adorable "Hang in There" set as much as I'd like yet but I'd been meaning to make a little koala card, replacing the branch part of the image with a real twig, so I thought the Tuesday Trigger combo of natural Kraft , yellow and black would go great! I inked up just the koala, colored, and then cut it out, the paws behind the branch and back arm are separate. Then I just went out in the yard and hunted around until I found the perfect stick! (hey, try getting involved and make them go do it! LOL!) :) It's so fun to put a natural element on a card, and gives it a great masculine feel. I glued my twig and back pieces on with Mono Multi on the Kraft background stamped with the leafy branch images in Memento Black, then popped up the body with two layers of dimensionals to compensate for the thickness of the twig. Base is Pure Luxury White, plus Black Onyx and Lemon Drop mats. Have a wonderful weekend! Some exciting stuff coming up, stay tuned! I noticed the fancy tag die would make a beautiful bookmark base, and a rose at the bottom would look like it was climbing a fancy trellis. After die cutting the tag from Pure Luxury White, I stamped the greeting from the set at the top in Memento Black and rubbed a little yellow ink in along the top edge while the die was still in place, gives it a glow like a sunrise or sunset. TIP: I placed my tag die onto Pure Luxury Lemon Drop CS and traced around the outer edge, which gives your tag a perfectly shaped mat once you cut it out! Next I inked up my rose in Vivid Lemon Ice, added just a bit of shading directly to the stamp with a Memento Cantaloupe marker, then stamped onto White Pure Luxury and trimmed it with Cutter Bee scissors. I stamped two of the leaves onto Creme de Menthe card stock and cut these out too, then adhered all the three pieces to the bottom of the die cut. Before gluing the mats together, I put a long strip of ribbon between the layers in the middle to look like a stem, which hangs out the end of the book. TIP #2: I refrained from using dimensionals or adding any thick bling like pearls, while that could take the project up a notch aesthetically, from a practical standpoint, I don't want any bumps on it: flat I think is better in this case for marking your place! Tonight, we welcome you to join us by using one of the newest February release stamp sets from any of our fabulous illustrating team. Choose any two of our new spring colors to create your card. The colors can be in the card stock, buttons, ribbon or patterned paper. Then, add your project to the Mister Linky on Gina's blog here. Gina will view every single project linked and she will choose one winner who will be invited to join the Design Team for the month of March. The winner will receive the entire March release including the brand new StampTV kit, stamp sets, card stock AND will participate in our Design Team preview party, release party and special Senior DT and Illustrator blog hops! The Mister Linky contest will end at Wednesday night March 3rd at 8:00 PM CST. The winner will be announced on Thursday morning and his/her DT package will ship out on Thursday in plenty of time to get ready for their term on our Team! For complete details on this exciting blog hop event, please check out GinaK's blog! We'd love to have you join in the hop by adding your project's direct link to Gina's blog in the Mister Linky box. AND, we have a gift for you! Starting tonight at 10:00 PM through Sunday night at midnight, place any $35.00 order and you can choose a free set of stamps from this category! (Valued up to $24.95!) Now is a great time to stock up on what you need and get some great stamps for free! Now THIS card is my 7 year old son's who wanted to CASE my card after he saw me coloring my butterfly. He colored and cut it out himself and LOVED doing the glitter part and using the heat gun! See how much more dramatic the butterfly is without the embossed frame? (IMO) Now of course you'll notice a HUGE shadow under the butterfly like it is not attached but hovering. Well, I was so proud of him, he engineered this terrific pop-up all by himself by folding up two strips of paper at a couple different angles to have it standing out about two inches from the card without drooping, very cool! It won't flatten to fit in an envelope, but that's okay, hand delivered cards when you can are best, right? Thanks for visiting and letting us share today! It's a new week, and another amazing "Pressed Flowers" creation from Diana, which she calls "Window Box Morning Glory", and it is truly glorious! Window box is made from pumpkin spice and ivory Gina K Pure Luxury card stock and an EK Success edge punch. The flourish die cut is by Quickcutz. Gina K Goes Moxie Fab! Hello! 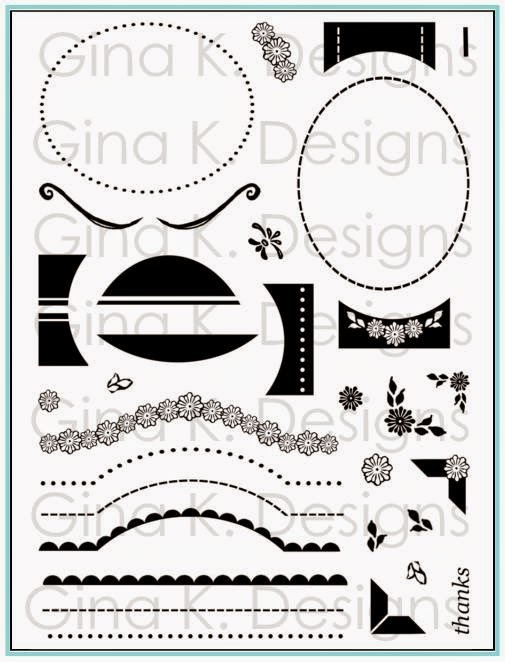 Gina K. Designs is sponsoring the Moxie Fab World Blog today! 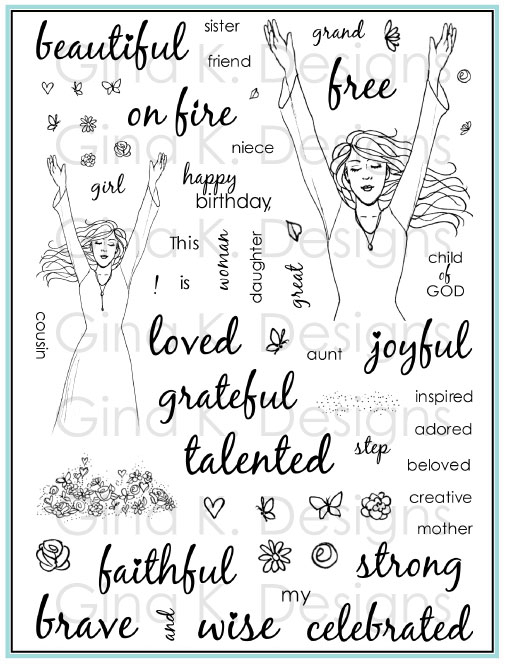 Check out the 8 fantastic Gina K Designs stamps sets Cath Edvalson is giving away in celebration of Stamp It! Cards week long celebration! Instead of using the set's sweet dandelion today, I cut out my "Pressed Flowers" daisy image stamped in Vivid Brick ink on white CS, trimmed two of the petals off and then popped up everything over the stamped stem... loves me, loves me not! I did a two-toned effect on both the stems and leaf and on the word "laughter" with two green markers to add some more dimension. Last, the pop of Gina K yellow and black buttons for the flower center contrast beautifully with the crisp White Pure Luxury base. This clean and simple card with very minimal supplies can be recreated in less than 10 minutes! Thank you very much for visiting me today, my wish is that you'll return often! :) Now go check out our other designers links for more samples with all the prize sets at Gina's blog, and then stop over to The Moxie Fab World Blog (you do not need to make card for the Tuesday Trigger to win, just leave a comment in the comment section) for a chance to win those fabulous stamps! Good morning! Today's card uses one of the techniques I suggested in my tip sheet for "Pressed Flowers", it' called Emerging Color. The small leaves and large flowers in this set are perfect for creating a pattern on a pattern, you need image large enough to show the shape of the images below. 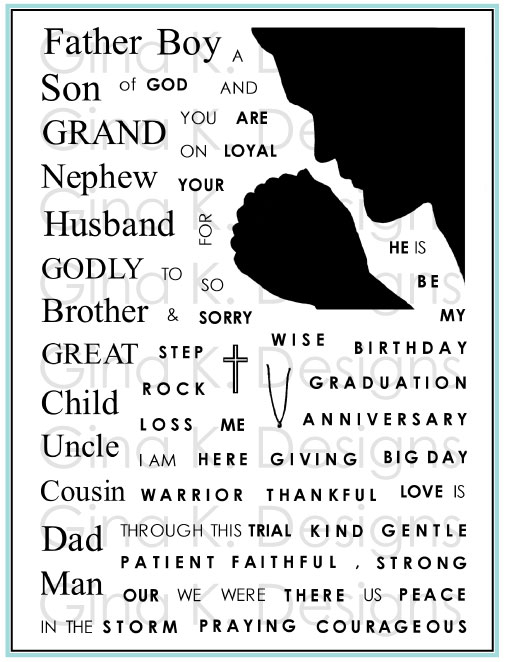 For this technique, you'll also need glossy card stock, clear embossing powder, Versamark, heat gun, and a sponge. First stamp some of the different leaf images randomly on the glossy CS in olive ink. Next stamp the big daisy three times over the area covering up the leaves in Versamark. I already did it in this step but you won't be able to see my stamped flowers until I emboss and sponge it in the next step. Sprinkle on the clear EP, and heat. TIP: A superfine detail embossing powder would be best for this to really pick up all the detail in those petals, mine ran together a bit here. Now sponge on more olive ink and the white daisies will emerge, leaving the green leaves stamped below them to peep through! I stamped the "A Year of Flowers" outline in Stazon Black to pop the detail out a bit more and added black buttons for the centers. Mats are Black Onyx and Soft Sand, this palette is so fresh and natural ( a little like the new very popular Basic Grey Origins that I haven't had a chance to use yet!) Refer to top for finished card and below for a closeup of the the new pattern I created. Today's card uses Spring colors and "Square Pegs". I wanted to put something on this card a little extra special to highlight this "eggstra" greeting in my set, so I decided to stamp two of the bold eggs in pastels, leaving them plain, and then adding the flower border to the third one with some sparkle and pearls to bling it up above the sentiment! I added a large stamped flower to match, punched the flower with the yellow Marvy Extra Jumbo flower punch, layered over the black punched with the blue Super Jumbo flower punch and embossed this large Cuttlebug flower border. Card base is Innocent Pink. Hope you have a great week, some exciting hops coming up in the next few days, so stay tuned! Hello! Today's sample is an easy one, using the line art rose from "A Year of Flowers" inked in Vivid Brick Red and the bold one from "Pressed Flowers" in Vivid Tuscan Tan. I cut them out and popped them up over the bold tan stems. TIP: One of my favorite ways to mat flowers is to have them extend over the edge of the mat to imply growth. :) For the background I stamped the leaves in tan on Soft Sand CS, and matted onto Lipstick Red and White. A few adhesive nail heads add some bling! Today I wanted to use my new "Pressed Flowers" set to make a flower that looked like it really had been preserved between these pages long ago. To give it that really delicate, almost translucent quality that aged pressed flowers have, I stamped on tissue paper today, but you can also use vellum paper. First I inked up just the bottom of my bold daisy to make it into a cone flower. Two shades of purple on the petals, a yellow and mustard on the center. I applied it to the page with Mono Multi, here is the closeup, I love how the words show through! In the photo it may look as though I might as well have just stamped it onto the page, but in real life, you can tell there is another layer there and run your finger over it and feel the same texture as a papery, preserved flower, which I like. 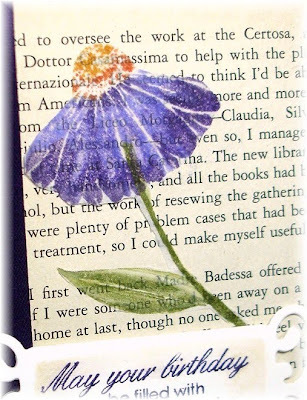 I matted onto Black Onyx and Lovely Lavender, and the greeting (which goes so perfectly with this book, ribbon marker and flower) on the fancy tag is from "Inside and Out". *In case you were wondering, this was not some wild romance novel, but took place in a convent where a sister was working on rebinding and restoring an old book by the same name. I can't remember after all these years if I liked it or not, but can't remember thinking I needed to read it again LOL! It's art now! "Pressed Flowers" gets a little "grungy" treatment today: what starts out as a fresh and clean card goes "Goth-fairy tale" with some stencils and sponging, look! First I inked up my bold "Pressed" sunflower in dark pink and stamped stamping off to get the light shade then reinking and repeating to make the 4 flowers on this one layer Pure luxury White card. Next I took my line art sunflower from "A Year of Flowers" and inked up just the flower center and inner part of the petals with black, stamping over the dark pink blooms, then cleaning off the stamp and inking the same areas of the image in dark pink and stamping onto the lighter pink blooms. See how they pop? I added some black stamped sunflower leaves which is such a great contrast to the white and pink. Then I used this new little Tim Holz mask (stencil) pack I got for only $2.50 at Michaels. That little flourish was exactly what I've been wanting to go with both these flower sets, I am always drawn to big flowers with curling, swirling tendrils on cards, clothing, fabrics, you name it! This one is a great shape and scale for both my images and A2 cards. Unfortunately , my sponging pic did NOT turn out (wah! I hate when I lose a step in my step by step posts!) but you place the stencil over the places you want on your CS and sponge away, remove and you are left with this shadowy image! I used both the flourish and the negative portion around it to stencil the two designs, which is why you see the black going over the edges of the card. If it looks a little "swipey" in places, although it was the look I was going for (what I used to hear called MOP, or Messy on Purpose, like distressing) it is also because I couldn't locate any of my sponges or daubers on my diSASter of a desk after all the release stamping last week LOL! Not to be denied, (I had a card to finish!) I wadded up a paper towel and got dirty in the black ink, whatever works! I also sponged over my envelope to match. The more heavily you apply your sponged ink, the more crisp the details in your image will be; the less you use the more smoky and atmospheric they become, I love using a mix of both! Sentiment is from "Say it with Flowers". Thanks for visiting! Have a good one! Wow!! I want to make one in every color, it's just so precious! To make this you need to stamp out 8 of the frilly flower from the set. What perfect proportions for an A2 card! Use a craft or chalk ink like Diana did here onto darker CS and then trim to leave a little border isn't that a great look? And I love how she repeated the same image to make that frothy looking background and border. "The flowers stamped on the white card stock as well as the ones on the purple are stamped using Spring Pansy and misted very lightly with alcohol before stamping. The leaves are stamped with bamboo leaves dye ink and not misted with alcohol. I cut a heart base to arrange the purple flowers on, then added it to the middle layer which is embellished with ribbon and lace. (It looks like I used "A Year of Flowers"...but I did not! A light colored ink stamped on a darker card stock gives the illusion that both stamp sets were used!" And here's more about the lady herself! FAVORITE TECHNIQUE: I adore paper piecing! I enjoy cutting out tons of lovely, little stamped images and putting them back together again! COLORS/COLOR COMBO: Whatever color my DD Anna Lura is wearing is my favorite color that day! FAVORITE GINA K SET BY MELANIE: I will always list Festive Frame as my favorite set by Melanie. I feel like I really grew as a card maker when I was assigned that set during my Center Stage Spotlight month. I always liked to make cutesy, whimsical cards...with Festive Frame I learned I could do create more elegant cards. I was thrilled! That being said...Pressed Flowers just may take over my favorites spot...I am having so much fun with this set! I can't even sleep at night sometimes because I think of something I want to try with this set! I'VE BEEN STAMPING FOR (HOW LONG): I'm a late bloomer ;D...I've only seriously been stamping for about a year now and I love it! 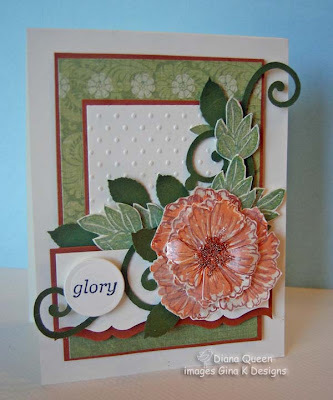 I GET MY INSPIRATION FROM: I love to visit my Stamp TV friend's galleries and blogs. That is truly where I find the most talented paper crafters! Technique wise you cannot beat the videos Gina K makes for us and the GKD design team and illustrators have really taught me a lot! THE MOST IMPORTANT THINGS I'VE LEARNED ABOUT STAMPING/CARDMAKING ARE: I don't have to be perfect...some of my better cards are the ones I just have fun with. I tend to over think some of my projects. SOME OF MY STAMPING/CRAFTING GOALS ARE: I just want to have fun...wherever that leads me will be great! FAVORITE THING TO MAKE THAT AREN'T CARDS: Oh! I love making the little note pad covers everyone is doing right now! I buy my little legal pads and have them cut in half at my local office supply store. They are fun and quick to make and my friends love them! SOME OF MY STAMPING/CRAFTING ACCOMPLISHMENTS: The best thing to happen for me was the e-mail I received from Gina K inviting me to participate with the October 2009 Center Stage Spotlight Team! It was a little intimidating, especially when I saw the list of talented ladies I would be on the team with! They are brilliant card makers! My family still teases me about spilling my coffee when I saw one of my cards featured on your blog! I'm loving getting to be your Guest Designer this month! CHALLENGES I LIKE TO PARTICIPATE IN: I enjoy participating in the Stamp TV challenges. Those are the ones I usually try to make something for first...then if I have time lately I've played with Stamping B's, Just Us Girls, Card Patterns and Embellish and our Vicki Dutcher hosts a color challenge on the Scrap booking and Crafting Friends site. WHAT I DO WHEN I’M NOT STAMPING: What I'm trying to do when I'm not stamping is keep up with my eight year old twins, Anna Lura and Connor! They are so full of energy and so delighted with everything life has to offer! They are a true joy to my DH and I! Now let's go see another "Pressed Flowers" project on Diana's blog here! Sometimes simple is best. And when you have a little "ha ha wink" moment you make with your stamps, that may be all you need to make your statement! So after assembling this bunny cupcake with the rabbit elements and cupcake from "Square Pegs", I went for simplicity. I cut it out and popped it up on the new Gina K Pure Luxury Innocent Pink (already ordered more of this yummy paper!) and a popped up layer of Black Onyx. That's it! Sure tickles me when I look at it, maybe I'll make some real cupcakes to match! What do you think? First print your piece of patterned paper or use regular DP. Stamp the roses in Versamark, cover with clear embossing powder, and heat. Stamp your leaves in olive ink over the roses, no need to mask as the embossing powder resists the ink, they will look like they are under the roses, love that! Now sponge pink ink over the roses, rubbing into the crevices to make the rose detail pop out, leaving the words shining through. Wipe off any excess ink. Have a wonderful day, thank you for taking the time to visit me! Hope you all had a wonderful Valentine's Day! (I'll be back to share what the kids gave me once I get the pics uploaded!) 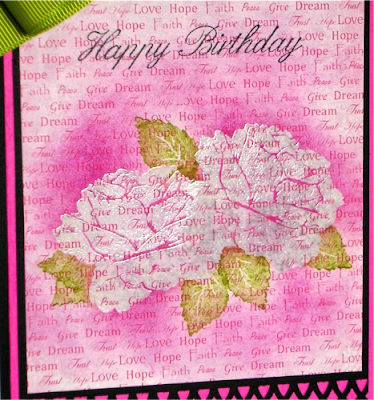 :) Today's card was a simple one: I used a piece of pink DP from a Basic Grey pack (all the "solids" 9which are still printed with terrific distressed texture) they always put with their prints are perfect for this!) and then stamped both the bold, frilly flower from "Pressed Flowers" and the matching line art flower from "A Year of Flowers" in black, starting with the bold and alternating the rows, leaving a space in between so the row below would 'nest' into the one above, then stamping the line art flower into the spaces. I love this new look, you can never go wrong with black! I stamped Nina's "Lovely Label" and greeting in black on white CS, the die cut and popped up over my new pattern, and added a line art cut out flower to the curling vine on the stamped image to match the background. Black Onyx mat punched with threading Water and mounted onto a White Pure Luxury base. Last I added some white dots to the flower center with my white Inkssentials Pen to make it pop a bit more, and match my punched border. A quick card, with very minima supplies!! Hope it inspires! Brenda is really going out with a bang in her last week as my Square Pegs Guest Designer with this over the top delicious cupcake jar and matching card! I had never seen these cupcake jars before, so I am so glad she turned me onto this wonderful gift idea! Two cupcakes fit in a half pint jar, so you could make 12 of these from one batch! She then embellished the top with the "Square Pegs" cupcake on some punches, adorned with metal dots (love these those little silver balls, used to be my favorite cookie or cupcake topper, now they are so hard to find!) Matching DP is Basic Grey Nook and Pantry. That spooky border punch she used as ooey gooey dripping chocolate was so inspired LOL! Last I have to point out that sweet Brenda clearly has a lot of my stamps sets (LOL! 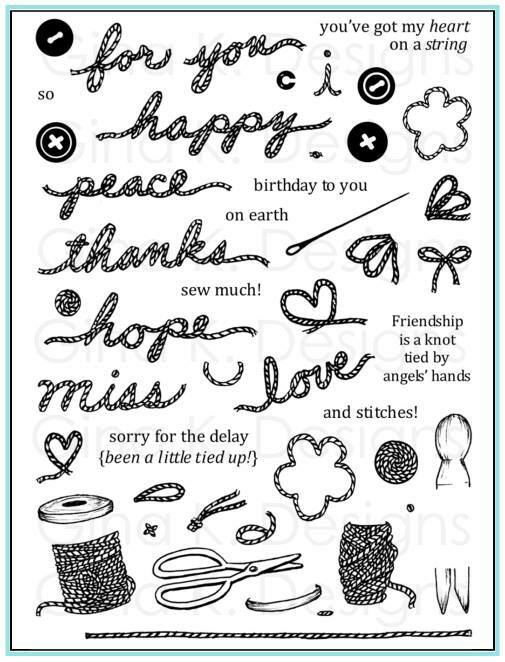 ): the little word window tags she tied on that add so much whimsy to this fun project are all words from a couple more of my most popular stamps sets: "chocolate" and birthday both from "Little Tees" and "happy birthday!" on the card is from "Tech Talk". (Celebrate is from "Square Pegs") Way to mix it up Brenda! You have been a GREAT guest designer! Let's go see what else Brenda has for us today! 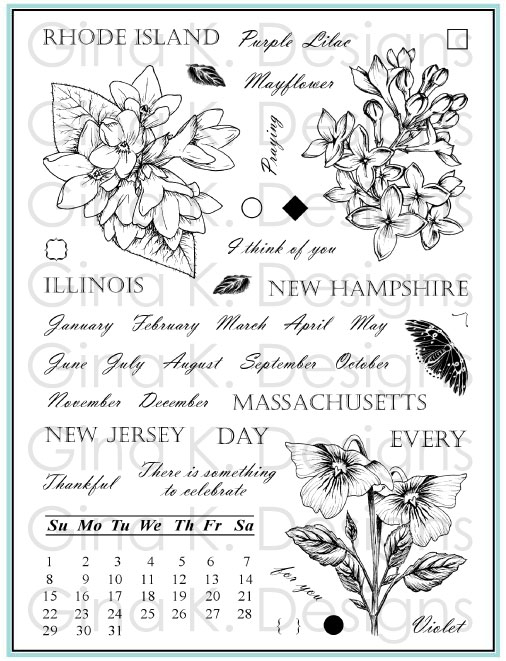 Your favorite stamp set just got better: All images in the "Pressed Flowers" set fit the line art blossoms, leaves and stems in "A Year of Flowers". (And this means the masks you already have for the first set will work with the second, don't you love that?!) Store these sets together, you will be reaching for them both all the time! Some of the tips below use both sets. If you don't have "A Year of Flowers" or have not not yet made masks for the set, it is well worth the time to take a few minutes to stamp out all the images in this set on scratch paper (I use printer paper) and then cut them out and keep in a bag with your set. You can use these to cover your stamped flowers to create a large arrangement that has flowers in the the foreground and background. The easiest way to make your masks is to ink up the whole sheet of rubber before you trim your new stamps and stamp once onto your paper before trimming them out! Depending on your arrangement and how you apply your color, you can make these images look very flat, like a pressed, preserved flower in a book or give them a lot more depth. Both looks will be very versatile! 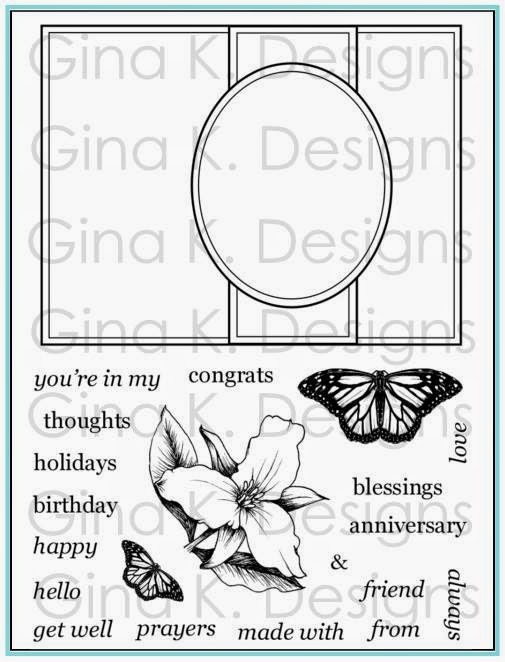 Use them on their own to stamp up designs with bold color in seconds, use them as a two step with the "A Year of Flowers" set, or mix them to have open borders and solid together. Throw your Ziploc bag of masks inside! When using the outline and solid together, stamp the outline first. Then use a stamp positioner to add the bold image. Eyeball it for a more loose look, like on the rose card, does NOT have to be an exact match. When masking or putting a flower together, work in this order: flower, stem, leaves. If you don't use the stems, stamp the flower first, place the mask over it and add the leaves over that so they will look like a cluster under the flower. 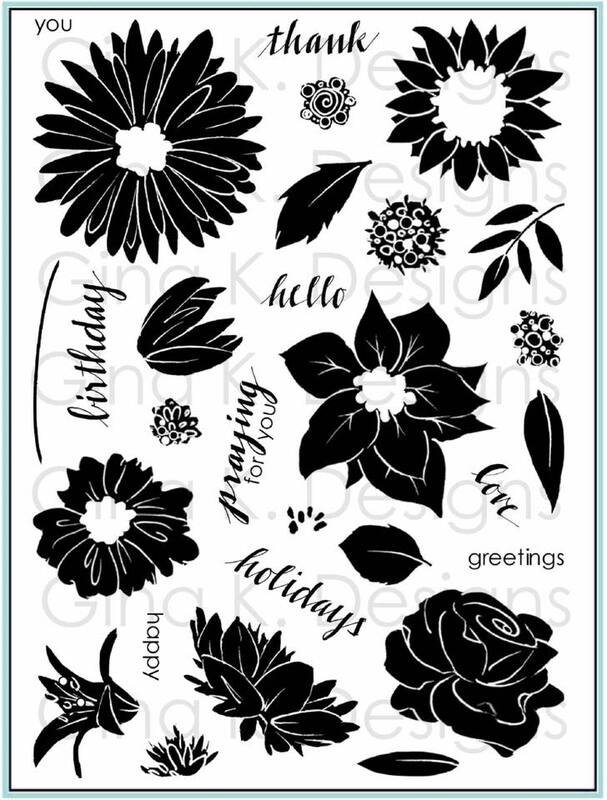 Stamp the "A Year of Flowers" outline in black or brown for dark contrast, or use a color a shade or two darker for the outline. Example: red outline rose with a pink bold rose stamp over it. Try very different colors for the bold and the outline like tan with red, or even color that flowers don't come in to create a really funky, contemporary card! Stamp the bold flowers tone on tone to create a dry embossed look without embossing. Example: Versamark or aqua ink on the Ocean Mist cardstock in this sample to create floral patterns or scenes that will look you have Cuttlebugged them! 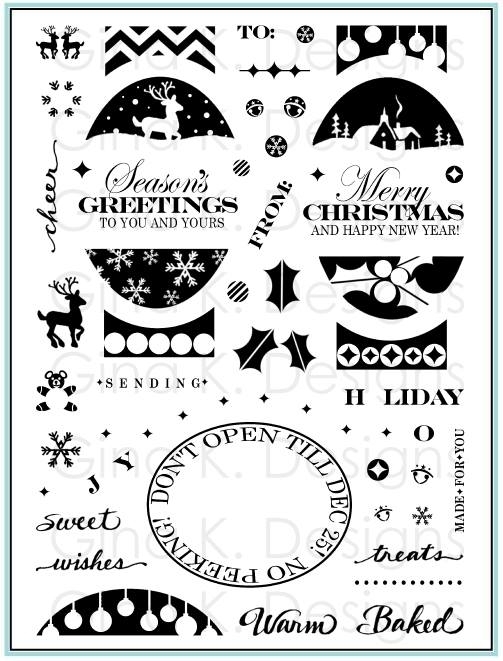 Rock and roll: ink bold image in a lighter color, then roll the edges into a darker color (the lower part of the image will give it a realistic dark underside) and stamp. Example: spring green for a leaf rolling the bottom in olive. Embossing: Versamark, add embossing powder and heat! Example: Silver or gold roses for an elegant wedding or anniversary card! Emboss Resist: stamp in Versamark and emboss. Sponge color around it to make your embossed flower pop! Ghosting: Stamp onto glossy cardstock with Versamark, then sponge over then the Versamark will resist the colored ink. Poppin Pastels: add lots of different soft colors and shadows by stamping in Versamark and sponging pastels over it, example orange on the center of the daisy, yellow on the petals. the chalk only sticks to the Versamarked image. Pullin Pastels: rub chalk onto CS and then stamp your bold flower inked up with Versamark onto the chalky background, when you pull the stamp away it takes off the chalk to give you a negative image. 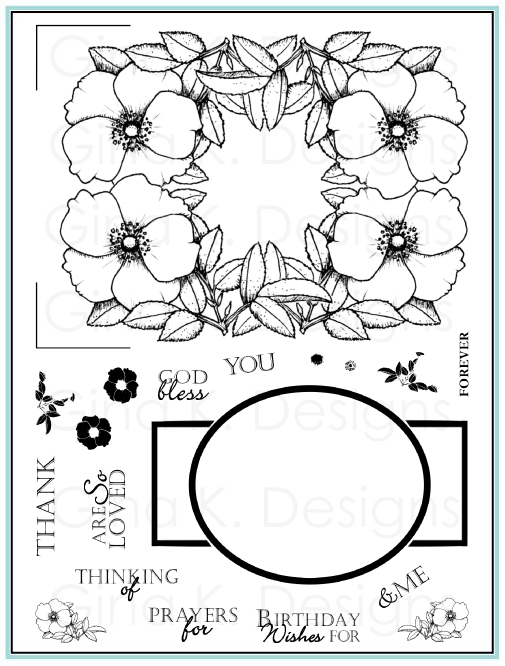 Emerging color: stamp smaller flowers and leaves in different colors from the set all over white or light CS, then stamp the large daisy over them in Versamark and clear emboss. Sponge ink or brayer all over and the daisies will resist leaving the other images to show through. Direct to Stamp: Color directly onto your images with markers to put the color exactly where you want it, then stamp. Tracing over the veins in the leaves with a darker green will really make these pop out! See these first two samples. Kissing: stamping a funky pattern onto your bold flower before stamping can give some really fresh results, try polka dots on the daisy or perhaps some script onto the rose. Misting: mist your cardstock or mist the stamp after inking and then stamp to get a lovely watercolors look to your bloom. Bleaching: Create a "stamp pad" from bleach and paper towels and stamp the flowers onto colored CS. Watch the paper change color and see a beautiful floral pattern emerge! Be sure to clean stamps well after using bleach. Create beautiful, bold backgrounds in a flash with one or two colors and the new images, then add a single flower for your focal point, either the bold or a colored line art one from "A Year of flowers" and you're done! Create amazing patterned backgrounds with these bold images and designer papers. Example: take a solid colored (distressed) or delicate patterned piece of Basic Grey paper and stamp the flowers all over in similar or darker colors to create a wonderful new floral! Embellish the flower centers, with buttons, glitter, pearls, rhinestones, etc. Trace the details like petals and veins in glitter pens or black gel pen for a sparkly or embossed look. Bold flower stamps are great for home decor. With craft inks or paint, you can add them to walls, cloth napkins, painted wooden containers etc, go wild! Use them to create gorgeous gift wraps, tags and bags for your gifts! Possibilities with this new set cannot be fully covered in any one post or tip sheet! :) So instead of going on and on typing here, I'm going to go get busy stamping more samples!! I will be sure to share lots of techniques and samples with both sets every week for you inspiration! Here is a super simple card I made by inking up my new daisy with a light pink pad, deeper pink marker with a bit of yellow and mustard in the middle before stamping. I cut it out and popped it up over the stamped leaves. White Pure Luxury is embossed with a Classic Square Nestabilitie and mounted on Innocent Pink. That's it! I will be posting my tip sheet tomorrow, so be on the lookout for it! Can't wait to see the new stamps in action next week after your orders start arriving! Thanks for all the flower love! I love the set - as I knew I would! Can't wait to have it come home to me. I especially like the way you did the first card with the lavender. Truly I love them all! Please send me your snail addy, Miesje! Congrats!! :) good night!! Our last two sets to peek before the big release party! Since we have are showing a set of label frames and a set of greetings, I used the labels on both cards and two of our other new release sets with them. Here is the first. You are going to flip when you see all the beautiful patterned labels in Nina's "Lovely labels" set that will take some of your favorite Nestabilities dies to a whole new level! here I used this large one in Labels One Die, it has a beautiful patterned border plus a curling vine up the side. This vine allows a wonderful opportunity to work in paper or stain flowers to transition into your background, or a stamped image like this one from my new "Pressed Flowers". Aren't they beautiful together? Cardstock is Pure Luxury White and Ocean Mist, I stamped everything in aqua ink and hit the flower with a darker turquoise marker before stamping. Stamped tone on tone with the aqua background, the flowers now look embossed into the mat. 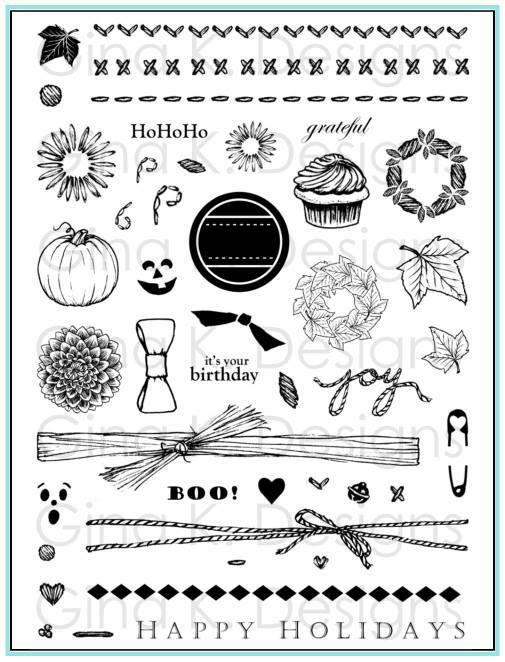 The Lovely Labels stamp set coordinates beautifully with Spellbinders Labels 1, 4, 8, and 9. Nina has also designed a new digital paper pack called Swing into Spring, which has been popping up in many samples here and there all week, that compliments the new Spring Assortment paper pack. For even more information on these new products, please visit the Lovely Labels Illustrator's blog Nina Brackett. We'd love to have each of you make plans to join us tomorrow night (Thursday) for the big Release party over in Gina's Forum on SCS! The virtual party starts at 7pm CST and is filled with contest questions from Gina, challenges from three of our designers, and tons more samples from the entire GKD team! For some helpful tips on how Gina's Release parties work on SCS, check out this discussion on StampTV. Welcome back to our sneak peeks! First up we have Gina K's new set" Spring Florals", elegant flowers and greetings to go with! Here I colored and sponged one pair of flowers (colored them to look like Blue Eyes but the coloring on the card looks much more purple in real life and closer to the lavender CS) after die cutting it with an Oval Nestabilitie and layering it onto the Labels 7 like a picture on the page. I scored it in the middle and adhered it with pop dots on the right only so it's swinging freely. Greeting is a peek of one of tomorrow's sets! I couldn't help adding the butterfly from Hope is Faith that you saw Monday. :) Cardstock is White and Black Onyx, and the new Lovely Lavender and Lemon Drop, both Cuttlebugged With Victoria. Some adhesive pearls complete the card. I have another sample using Spring Florals in our previews tomorrow, so many of the sets work so beautifully together! This month Asela has new animal set with "Dream Birds". I stamped this little pair with the tic tac toe board in the middle as though they've been scratching their turns with the beaks (feet? whatever! LOL!) I colored them with Copics and popped up just the birds' bodies separate from the legs. Last I stamped the love sentiment in Versamark and added the tiny heart from the tic tac toe board over the "O" in love. Card base is Pure Luxury Oean Mist, I also used White, Lipstick Red, and more of Nina's new "Swing Into Spring" digi paper, the lavender is an unexpected pop of color! For a limited time, a free Card Kit will automatically be included with each purchase of the Spring Florals stamp set. 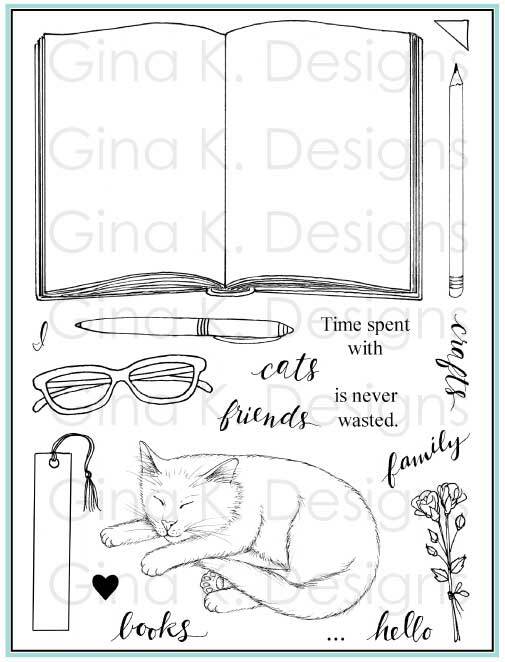 The entire kit includes the stamp set, a binder sheet, the instructions and materials to make 3 complete cards for $19.95. For more details on the cards, please visit Jessica Fick's blog. Then, check in with each of these GinaK designers to see all the beautiful projects they've made with the two stamp sets previewed tonight! I'm so excited to present my newest set this month, because one of your favorite stamp sets is about to get even better! My February release "Pressed Flowers" contains bold images of all the classic flower elements you love in "A Year of Flowers", plus new sentiments! Like blooms preserved in a book, it will be a timeless addition to your stamp collection. On its own, "Pressed Flowers" can be used to make wonderful vintage cards or very stylized, trendy ones, perfect for creating year round cards in vibrant color using a variety of techniques like kissing, direct to stamping; but paired with "A Year of Flowers" you'll get exciting new two-step combinations without having to color, and there won't be a stamping technique you can't do with both sets. I'm really having a blast finally getting to play with both (this was a really hard one to wait for!) Although I adore coloring the line art with my Copics, I know not every one has them and sometimes you just don't have the time or inclination to color! With these you don't have to. No coloring on any of these flower samples today, unless you count scribbling on a stamp LOL! This first card uses just "Pressed Flowers". I wanted to show direct to stamp as well as what beautiful custom backgrounds you can make to match them in any color, no need for DP! I inked up my flower with a light purple waterbased marker, loosely adding a darker purple to the middle and then yellow and darker mustard to the flower center before stamping, then stamping once again without reinking to create the second flower. I cut them out and popped them up over my stamped leaves and stems. the background I inked up just the flower in lavender and went back adding some green leaves, didn't even bother with masking, hee hee! I sponged on more purple ink to soften it and on my focal point before removing my Labels Eight Die. "Bloom" on the tag is also from this set, perfect for spring or an anytime reminder to enjoy growing! Base is Vibrant Violet and embossed CB background is Victoria. This last card I combined both the new set and "A Year of Flowers", but instead of using the new bold stamps like "fillers" for the images, I stamped solid black stems and leaves from the new set onto White CS and added the line art daisy from the previous set to make this bold graphic print, isn't that fun? Very modern looking, and completely different from the two cards above! 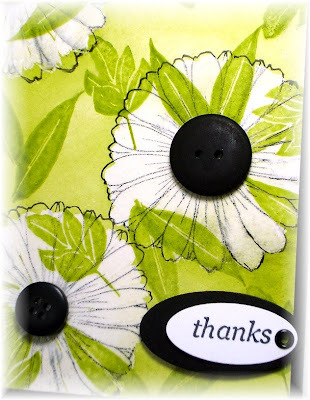 I added button centers from the new Gina K Spring Collection, an assortment of pastels in both opaque clear and pearlized buttons like you see here, and then added the thanks in a circle punch. Card base is the new zesty Pure Luxury Lemon Drop to match the button centers, I just love this color with Black Onyx and White, such a fresh combo! This card was finished in less than ten minutes, you gotta love that! Would you like to win this set? Leave a comment below telling me which of these flower cards is your favorite OR your favorite stamping technique to do with bold stamps. I will draw a winner Thursday and announce it before the party! My next peek uses Rupa's new "O Baby!" set! Although it took some time, I cut these little duckies apart because I wanted to link e popped up ducks with some real floss along with a little pearl tied on at the end for my pull string. The pearl is held in place with a glue dot. I used my new Labels Die like an alphabet storybook here, scoring down the middle and cutting my greeting stamp apart so I could stamp the "B" separate from the "blessing" on the different pages. Here is a closeup to show the coloring. I added a little button again for the Spring Collection as well as some yellow ribbon from the Spring Ribbon Assortment to match the Lemon Drop base (I pierced this with the Scor-Bug). Isn't the little safety pin sweet? The beautiful polka dotted DP is from Nina's new "Spring Into Spring" Digi paper, which coordinates with the other Pure Luxury pastels. 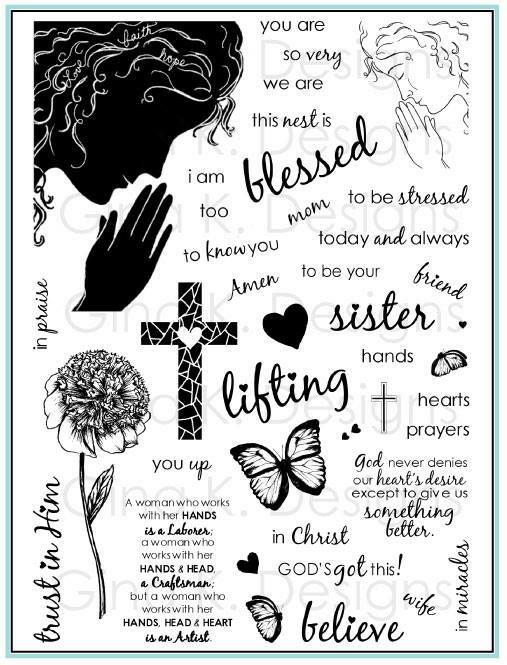 Now visit these designer's blogs for even more samples with the Pressed Flowers stamp set and Rupa Shevde's O Baby Stamp set as well! More peeks to come! Also, the winner of my flower picking contest from LAST week is....Carla Suto! Congrats Carla, the way you masked and arranged that trio of roses and then layered them on all the different dies just took my breath away! She will be receiving a copy of my new Pressed Flower set as well as designing with March's set next month, so stay tuned! Thanks everyone for all the wonderful submissions!